Fresh and fruity on the nose with green apples, orange peel and a touch of lemon. Vanilla and toffee arrive, nicely mixed with malted barley and a whiff of cinnamon. Subtle oak linger with a hint of tobacco leaves in the back. A pleasant sweetness on the palate with malted barley, honey, toffee and apples. Then a warming spiciness emerges with white pepper, crisp oak and a touch of cinnamon. Subtle notes of roasted bread towards the finish. The finish shows medium length with creamy caramel and fruit jam. Becomes slightly dry on the tail with oak and white pepper, nicely mixed with a touch of lemon and orange peel. Very refreshing with a few drops of water. Sweet and fruity with lots of green apples and vanilla. The spiciness, however, is completely tamed. Very restrained at first on the palate with a touch of fruitiness and malty flavours. Then slightly warm with oak spice, tender pepper and cinnamon. Notes of caramel towards the finish. The finish is medium long, less sweet but significantly dry with oak, orange peel and hints of tobacco leaves. This is solid, refreshing, and quaffable whisky with waves of rich flavours. Nice balance of green fruits, malty sweetness and oaky spiciness. A very clean Ben Nevis - pleasantly enjoyable with a nice texture. I preferred it neat. 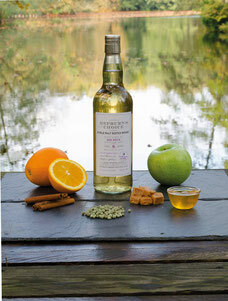 The recommendation on myDrams's tasting notes card is to pair this young Highlander with suhi - worth a try!